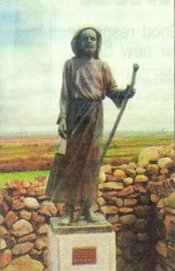 St. Senan was born in Corca Baiscinn, County Clare about 488. It seems that Senan's family had two farms, one at Moylough and the other at a place called Tracht Termainn. He placed himself under the Abbot Cassidan and took the monastic habit. Cassidan was originally from south-west Cork. Senan then went to the monastery of Kilmanagh (Ossory) to continue his preparations for the religious life. There he was credited with the performance of many miracles. He is next heard of having established a church at Enniscorthy. The Book of Lismore states that Senan went to Rome and from there to Tours, which was at that time, the great monastic establishment in West Europe. Returning to Ireland, St. Senan established a church and monastery at Inniscarra, in Cork. He then moved back to his native district. He began his work on the islands of the Fergus. He later crossed to Mutton Island, then to Bishop's Island, south of Kilkee. Finally, about 534, he established himself at Scattery Island. Before Senan arrived on Scattery, a legendary monster called "The Cathach" supposedly inhabited the island, terrorising people. Sometimes referred to as the "peist" or sea-serpent, the Cathach was depicted on a carving in the old chapel of Kilrush as the "Cata". On his arrival in the island an Angel led Senan to the highest hill from which he was able to locate the Cathach. He then faced the monster and ordered it, in the name of the Trinity, to depart from the island. The Cathach obeyed immediately and "neither stopped nor stayed" until he reached the dark waters of Doolough Lake at the foot of Mount Callan. Little is known of the Saint's life in Scattery beyond the miracles recorded and the fact that the rule of his monastery was austere in the extreme. Apparently, no woman was allowed to live in or even land on the island. St Cainir, a relation of St Senans, had a convent to the West of Ballylongford. She crossed the river and hoped to end her days on Scattery Island but Senan forbade her to come ashore. She requested the last sacraments and a grave on the island. Senan agreed to this and she was buried at high water mark. St. Senan is said to have died on March 8th, 544. The river Shannon is believed to be named after him. His patron day on March 8th was an important day of pilgrimage to Inis Cathaig. He is buried on Scattery Island, probably in Temple Senan. The grave is supposed to be the site of miraculous cures. Stones from St. Senan's Bed were regarded as relics and a protection against diseases and especially drowning. In the folklore of West Clare the cult of Senan still survives.